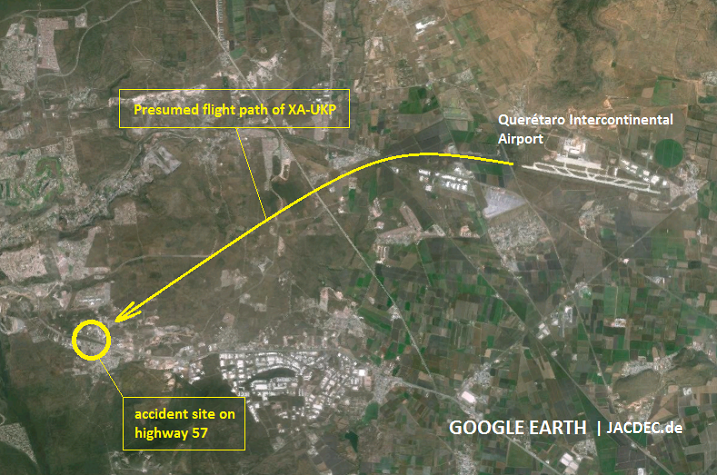 Very shortly after take-off on a test flight, the aircraft lost height and impacted ground next to the busy highway no 57, about 10 km west of Querétaro Airport. The aircraft was totally destroyed by impact and post-impact fire. There were no survivors among the 5 people on board. 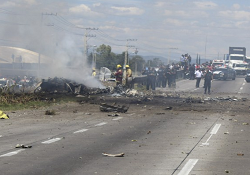 According to local media reports and the ministry of transport (SCT) the aircraft was on a post-maintenance checkflight with two pilots and three technicians on board. 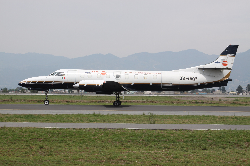 The Metroliner was about 9 minutes in the air then the crash took place. Local weather was good at the time. 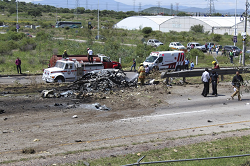 Unofficial reports indicate the plane earlier landed at Queretaro with technical problems. After repairs in the hangars of DHL it took off for a test flight but minutes later the pilots radioed control problems and announced their intention to attempt an emergency landing on the highway.